CCMPCS serves students ages three through eighth grade in several multi-age classrooms. Mixed ages facilitate constant interaction, problem solving, child to child teaching, and socialization. Beginning in Pre-K, students are introduced to Spanish. Spanish instruction continues through middle school with students receiving credit for Spanish I & II coursework. 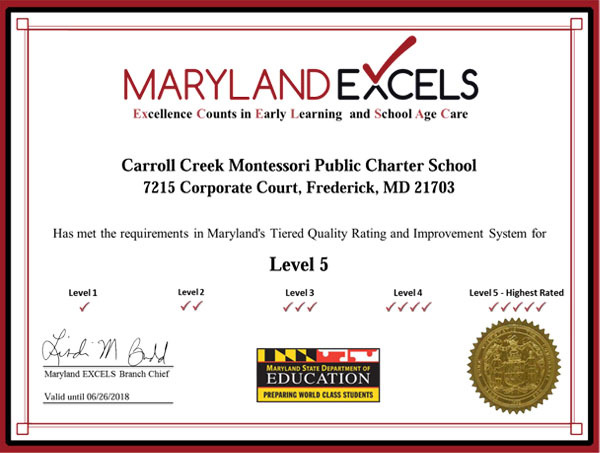 As a public charter school, CCMPCS is free and open to all residents of Frederick County. Admission to CCMPCS is determined by a lottery. 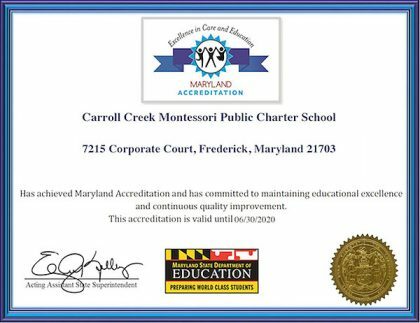 Carroll Creek Montessori Public Charter School (CCMPCS) is a public charter school that is operated by a non-profit organization, Monocacy Montessori Communities, Inc. (MMCI) within the Frederick County Public School system. CCMPCS offers a Montessori-based learning environment based on the Montessori Method as well as Spanish instruction for all students. As a public charter school, CCMPCS is free and open to all residents of Frederick County. CCMPCS especially encourages families who are native speakers of Spanish to apply. 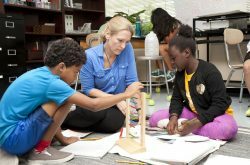 CCMPCS’s mission is to build a community in which students, parents, and staff work together to educate the “whole child,” the sum of the physical, emotional, social, and intellectual parts. 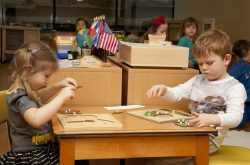 CCMPCS will implement a Montessori-based curriculum to give students the hands-on tools they need to be active learners both in and outside the classroom. By offering a content-based enrichment and conversational Spanish and English instructional program, students will develop strong language skills in both Spanish and English. CCMPCS will provide a unique opportunity for second language acquisition beginning at a young age, a critical component for development of language proficiency. 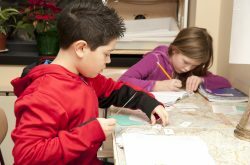 We offer a Montessori-based learning environment. Admission to CCMPCS is done through a lottery open to all residents of Frederick County. Spanish instruction begins in Pre-K and continues through 8th Grade. 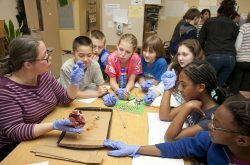 CCMPCS serves students ages three through eighth grade in several multi-age classrooms. We invite all interested families to come tour our school. CCMPCS has a variety of clubs and extracurricular activities in which students may get involved. Beginning in 2018, we will be using a new school communication tool. Learn more about how our Charter influences our school. More information about the Before & After Care program. Catch up on the latest school news! Newsletters are delivered monthly.